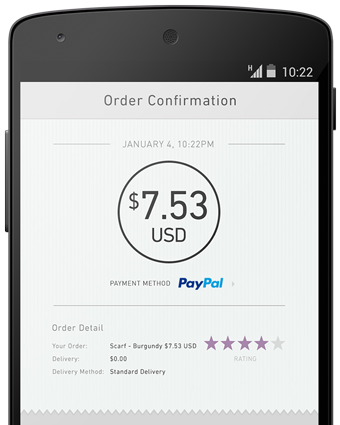 PayPal is accepted on millions of mobile sites and apps, just like it is on your computer. It’s the safer and simpler way to pay on the go. Sign up for your account for free. We’re integrated into thousands of iOS and Android apps. Shop on the go, pay on your smartphone and tablet just like on your computer. Tap into all your payment information. Put your cards and balance in one safer place. Once you link them to your PayPal account, you can select how you want to pay. Enjoy the same protection on eligible purchases as you always do. When you’re away from your computer, you can pay just as easily and even faster with PayPal. And the best part - you'll never have to enter your card details in public. 58 58% of smartphone owners have used them to pay.